I'm really anxious for strawberry season to start, especially with a local strawberry farm nearby. With strawberry season around the corner, I've been looking for recipes using strawberries so that I can use what I've picked. 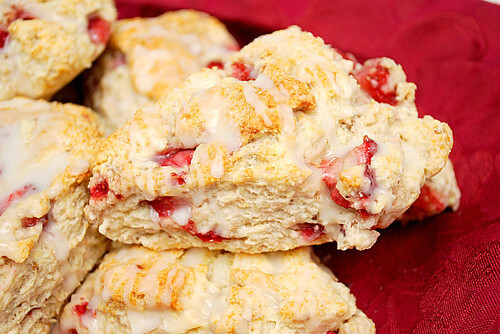 One recipe I came across was for strawberry yogurt scones. They looked delicious but I've always been a fan of strawberries and lemon flavors together. As a result, I added some lemon juice and freshly grated lemon rind to the original recipe so that the bright notes of lemon could stand out. It was a great addition and I imagine using lime juice and freshly grated lime rind would work just as well too! recipe adapted from Delicious! Delicious! Stir together dry ingredients. With a pastry cutter or two knives, cut in butter until mixture resembles coarse crumbs. Stir in strawberries and lemon rind. Stir in enough yogurt to be able to form dough into a ball (up to 3/4 cup). Turn dough onto floured surface and with floured hands, knead a few times. Press dough into a rectangle, about 1 1/2 inches thick. Fold rectangle into thirds, like a letter. Press dough into 9-inch round. Cut into 8 equal triangles. Place scones into scone pan or on a cookie sheet covered with parchment paper. Bake until golden, about 15 minutes. Remove to rack to cool. Whisk confectioner's sugar into the lemon juice and half and half, adding more sugar until desired consistency is reached. Frost scones while warm. oh my, that looks delicious! It's not quite strawberry season in Michigan but when it is I will definitely give these a try! I love that you used yogurt. Going to make these ASAP! I have loads of strawberries! Yum! And with yogurt too! Must add to the moist-y texture. The time of the strawberries have arrived! These look delicious! I think I might make some tonight.. mmm! Oh and Wendy, maybe you could try making them with those infamous fresh Michigan cherries, too? Yum, those look so good. Perfect for summer! 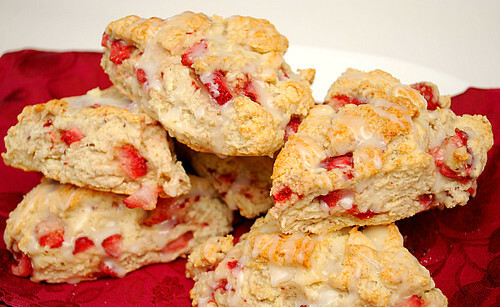 I was just thinking about making strawberry scones for this weekend. I love the addition of lemon! Looks gooooood! I just bought strawberries today. Love the lemon twist to this . Looks like it could be a big hit! These look delish...gotta wait for some fresh strawberries to be available now! Oh how my mom would love these, she's from England and puts on a 'tea' every year and makes her own scones. Perfect with tea!